April 16, 2019 March 20, 2018 by Leslie M.G. Basil is one of the most popular culinary herbs, and for good reason. Extremely versatile and widely used, it’s bursting with color and flavor. And its unique taste has been treasured and enjoyed by many cultures for centuries, as an aromatic addition to both food and drink, as well as herbal medicine. 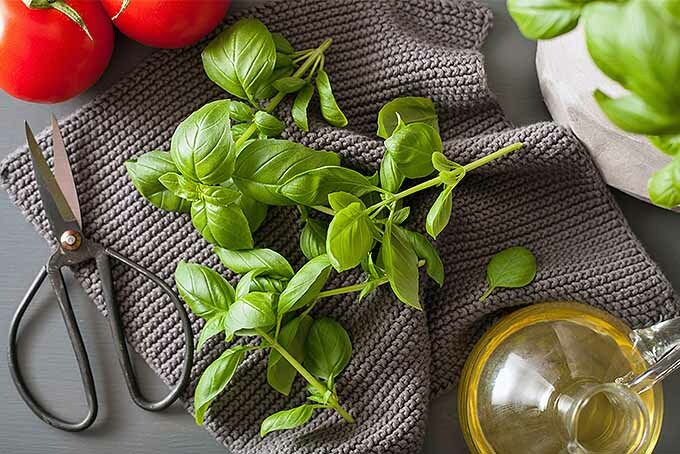 Whether chopped up and tossed into your favorite tomato sauce and cooked to perfection, or muddled in a refreshing summertime beverage, basil is sure to serve as a flavorful enhancement to many meals. Ready to add it to your herb garden? 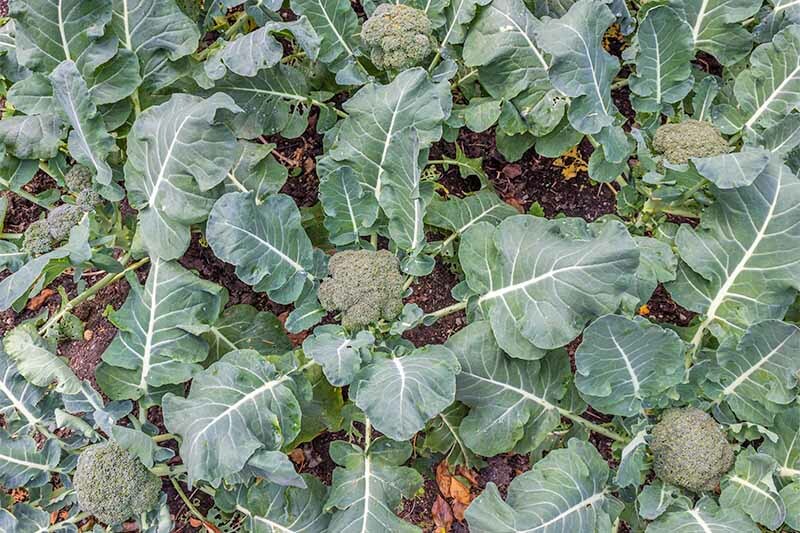 We share our top growing tips for a successful harvest, plus some of our favorite varieties. Let’s dig in! Native to India, Iran, and other warmer regions of Asia as far east as China, basil has been cultivated for thousands of years. 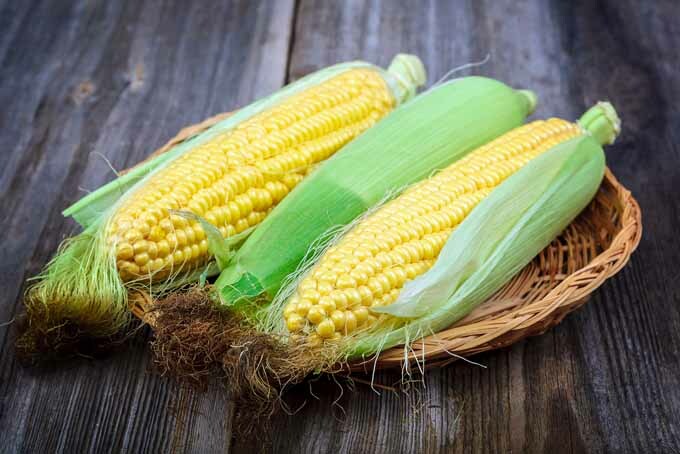 It was introduced to western Europe in the sixteenth century, and shortly thereafter, became a key flavoring component in Mediterranean cuisine. 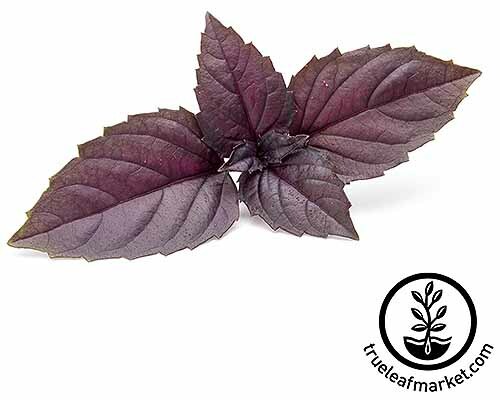 A member of the Lamiaceae family, basil is closely related to mint, rosemary, lavender, and thyme. 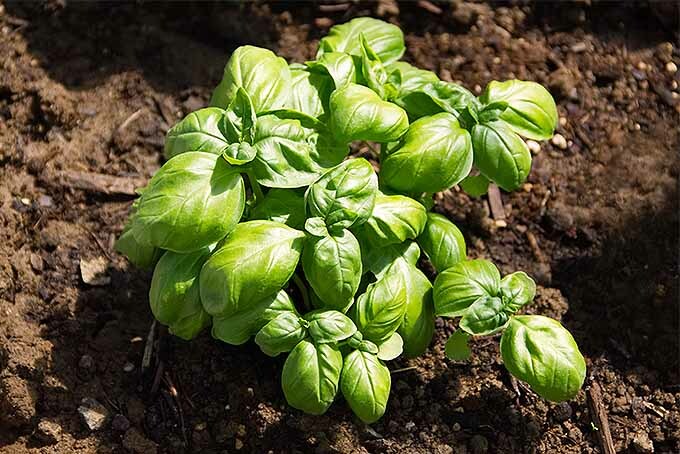 Sweet basil is the most common variety, especially favored in Italian cuisine. Other species and cultivars that you may already be familiar with include Thai (O. basilicum var. thyrsiflora), lemon (O. x citriodorum), and even holy basil, a slightly more distant member of the Ocimum genus known botanically as O. tenuiflorum. 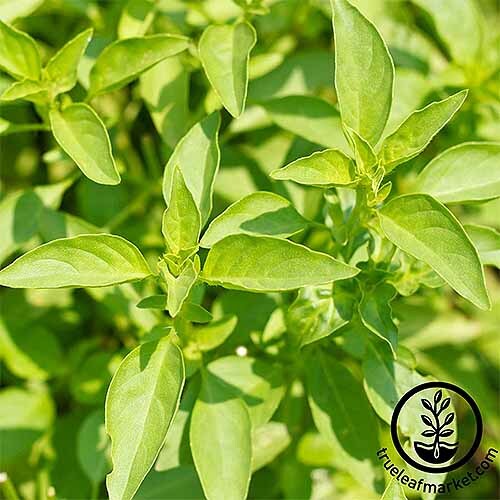 Whereas sweet basil is renowned first and foremost for its culinary use, O. tenuiflorum or tulsi is known for its medicinal applications. Originally recognized as a sacred herb in India, it is still grown today for its essential oil, and is used commonly in herbal teas. Various other Ocimum species and hybrid cultivars are grown commonly throughout Africa, South America, and elsewhere. 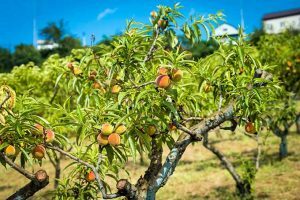 For the purpose of this article, we’ll focus on the sweet and Thai varieties that make a tasty addition to the culinary garden. 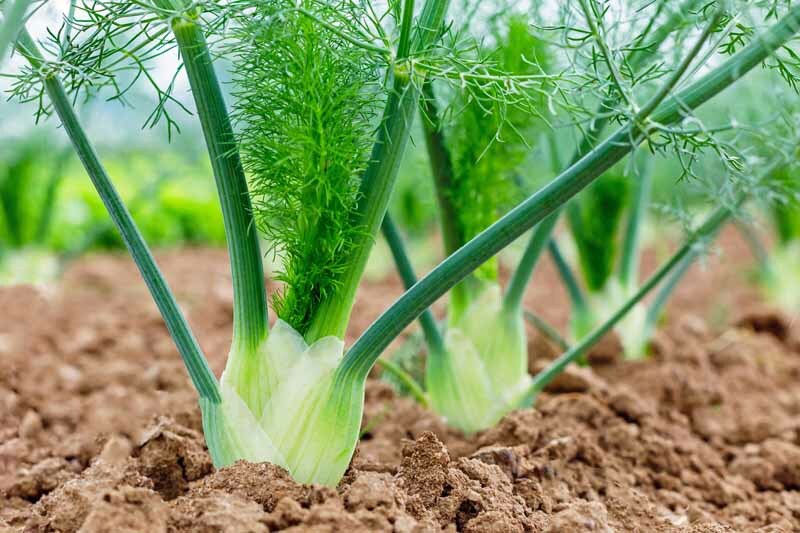 Today, this herb is cultivated in countries across the globe, and is used widely as both a medicinal and culinary plant. Seedlings can be purchased from some garden stores in the springtime, but most herbs are easy to start from seed. New plants can also be started from leaf cuttings that are a few inches long, taken below a leaf node. 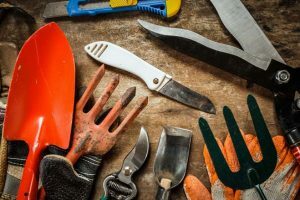 Some gardeners are very successful from year to year with starting new plants by taking cuttings from overwintered potted specimens, as long as the original plants weren’t allowed to flower. These can be rooted in water, and then planted in soil. Italian large leaf is one of our favorite varieties, and seeds are available online from True Leaf Market. 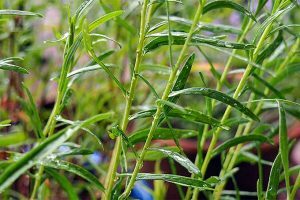 With enough sun and warm temperatures, you can expect huge harvests from this easy-to-grow herb. 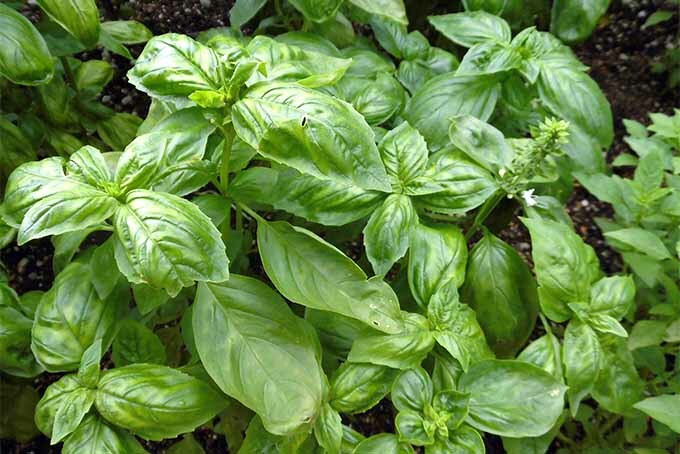 Genovese basil requires about 60-69 days to reach maturity, and you will love the flavorful green leaves that this cultivar provides. Seeds are available in several quantities from True Leaf Market. 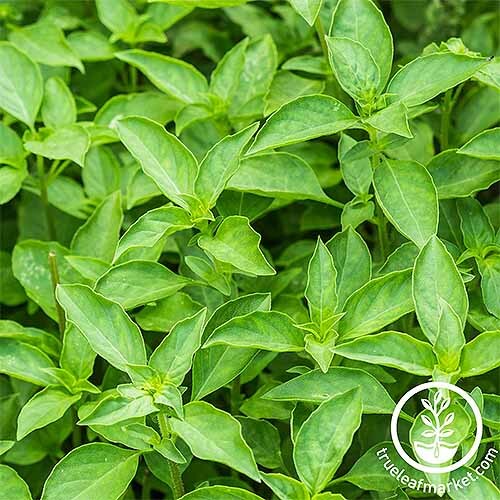 Thai basil makes a tasty addition to so many Asian-style recipes, with its sweet scent, overtones of anise, and deep green leaves. Expect 60-90 days of growth until harvest. Seeds are available from True Leaf Market. Looking for something a little different? 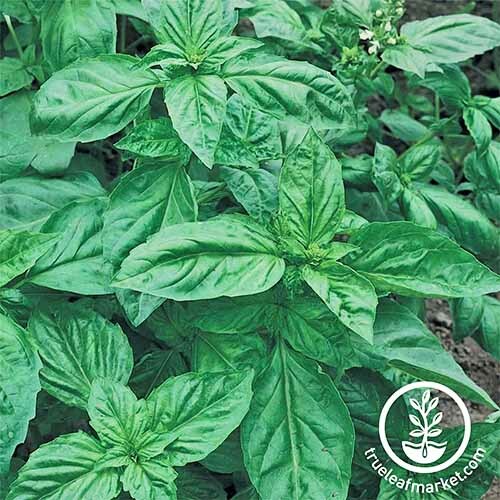 Try lemon basil, a hybrid of sweet and African varieties of Ocimum. What it lacks in leaf size, it makes up for with its unique citrusy flavor, thanks to concentrations of limonene and citral. Like other cultivars, this type does well in full sun, but it can tolerate partial shade. Seeds are available from True Leaf Market. For a nice touch of color in the herb garden (and on your plate!) 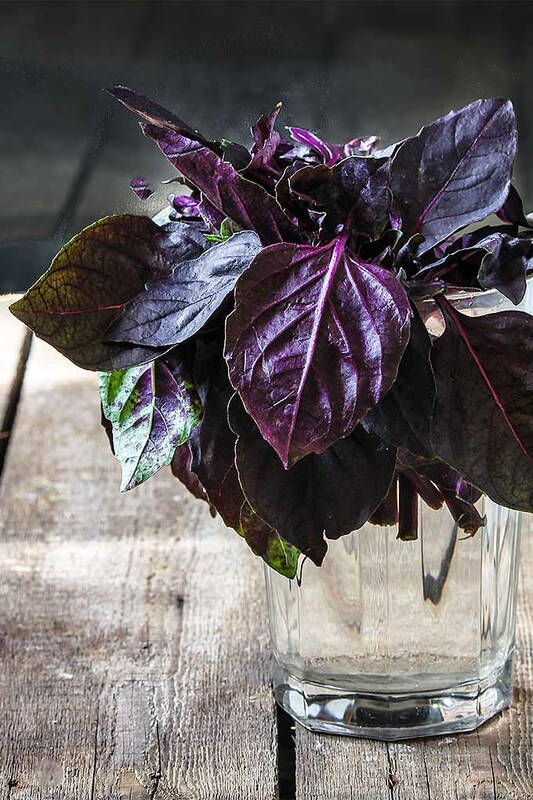 try Red Rubin, a dark purple cultivar that produces large leaves similar in size to that of the Italian large leaf. 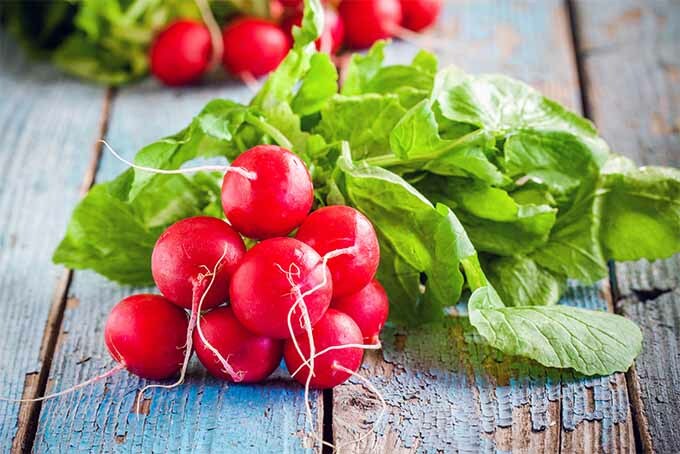 This variety is also excellent for growing microgreens, and they make an attractive garnish. Expect about 68 days to maturity. Seeds are available from True Leaf Market. Looking for a gift for the cocktail-lover in your life? 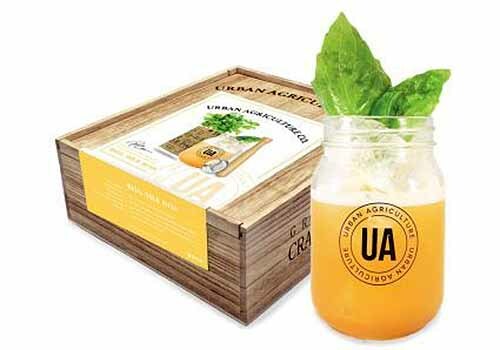 Try this Basil Gold Rush craft cocktail growing kit from Urban Agriculture. 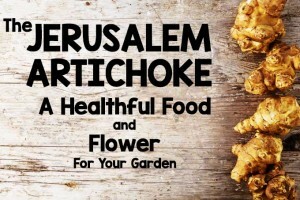 It includes a recipe from master mixologist Harry Chin, seeds, soil, and a container, plus a wooden muddler, straining spoon, and mason jar cocktail shaker. 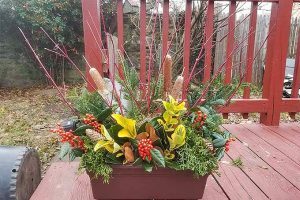 You can order yours online from Nature Hills Nursery. 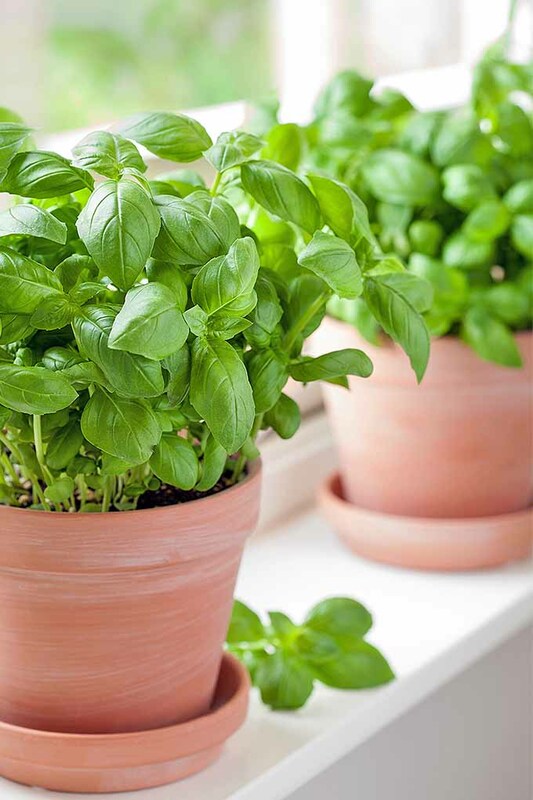 Basil can be grown in containers or planted outside directly in the soil, as long as it is not highly acidic. Well-drained and warm soil is best – try a mixture of compost, vermiculite, and peat to amend it. For more on peat moss and available alternatives, you might enjoy this article. 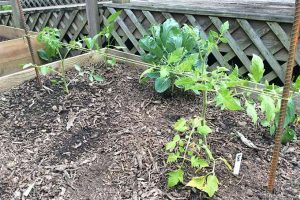 Ideally, soil temperature should be at least 50-55°F, which usually happens when the outdoor ambient temperature reaches consistent highs in the 70s. The warmer the weather, the better your plants will do in terms of leaf production, as long as they have enough moisture. Summertime is best for growing and harvesting basil, and if you live in the extreme south, year-round harvests may be possible. 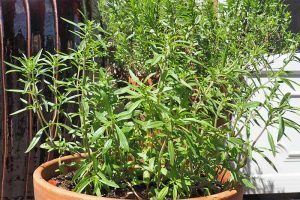 This is an annual herb, and you will get the best flavor if you replace your plants each year. But it can be grown as a perennial in USDA hardiness zones 10 and up. This herb is frost tender, meaning plants growing in the ground in cooler climates will generally die back with the arrival of the first frost. 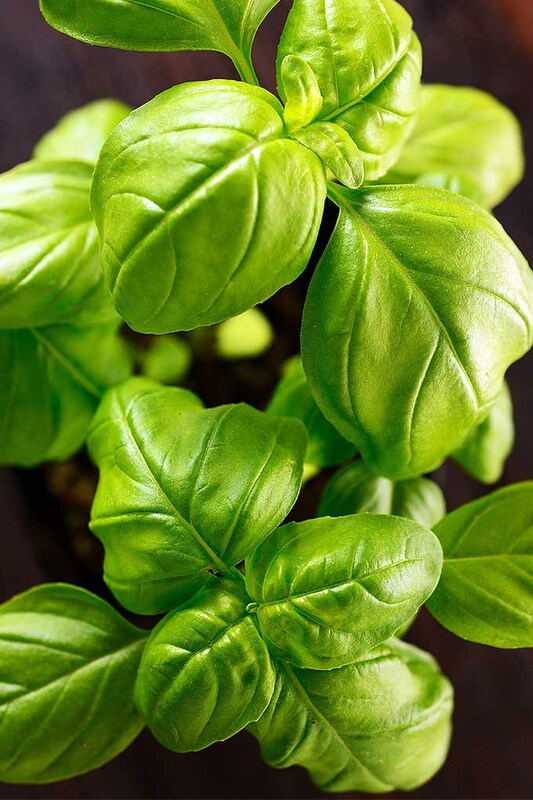 Basil also needs plenty of sunlight, and requires upwards of eight hours of full sun per day to thrive. 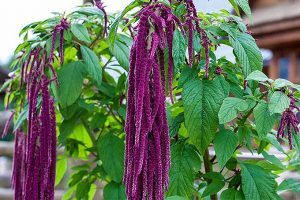 It can be grown indoors in colder climates under grow lights, or in a warm and sunny window that is protected from the cold. 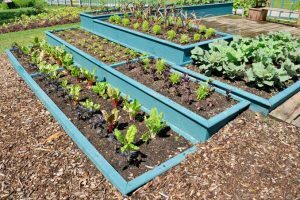 To plant outdoors, you can start the seeds inside or in your greenhouse about 3-6 weeks before the anticipated last frost, depending on the variety. Keep your seeds warm and moist, leaving them in a sunny window or under grow lights to aid germination. Once germinated, water your seedlings one or two times a day, making sure they get enough water and sunlight. The seedlings need to stay moist in order to grow. 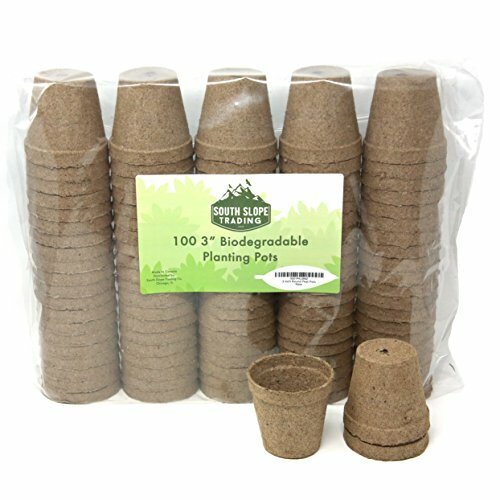 When they are about three to four inches tall and you can clearly see mature – or true – leaves forming, transplant them into larger containers, such as these three-inch peat pots, available on Amazon. 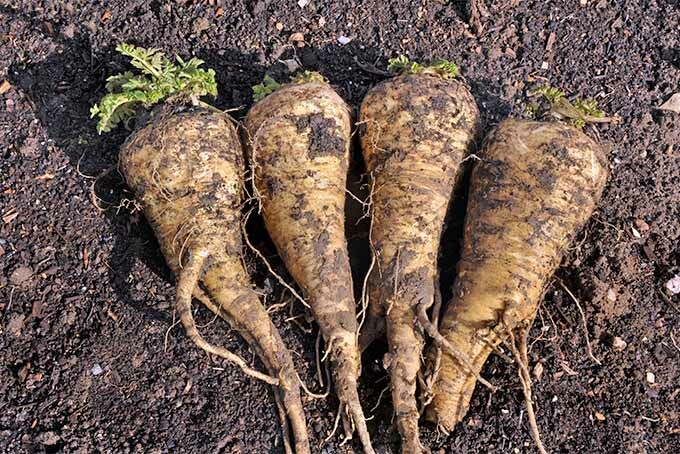 These can be planted directly into the soil when it’s time to transplant them into the garden. If seeding outside in warmer climates, plant directly into the soil, scattering the seeds and then lightly covering with dirt, and gently patting them down. Be sure to water the seeds daily, sometimes twice daily if your location gets an ample amount of direct sunlight. Whether seeding indoors first and then transplanting into your garden or direct seeding outdoors, be sure to leave at least 4-6 inches of space between each plant. Letting seeds sprout and then thinning them back, or thinning before you transplant, is recommended. Successive plantings can also help to extend the harvest. 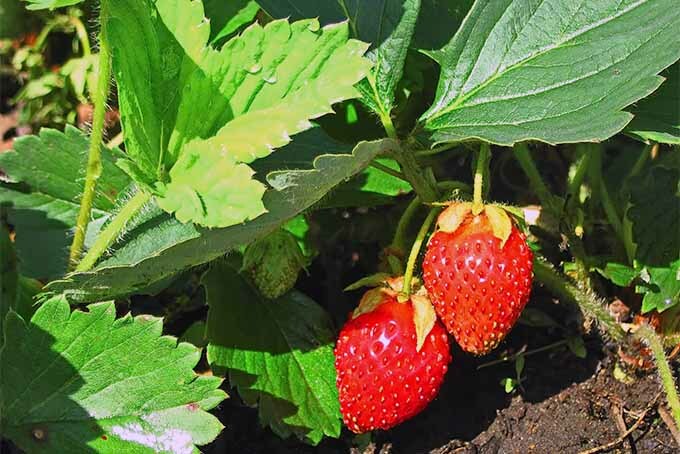 Just plant a few sets of new seeds every two weeks in the late spring or early summer. Basil will grow to be 10-18 inches in height, or much taller for some varieties, and can get relatively bushy, so it needs plenty of space. 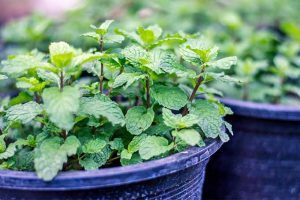 This herb loves moist soil, so be sure to keep mature plants watered well, and cover them up with mulch if you need to, for extra protection during dry seasons. 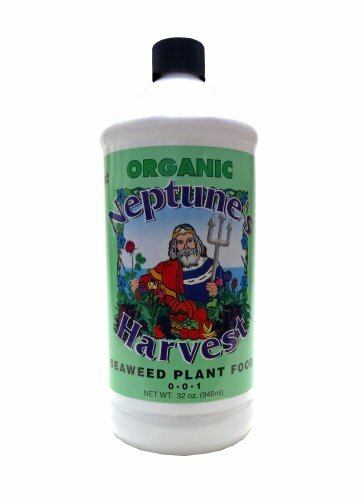 Neptune’s Harvest Liquid Seaweed Plant Food, 1 Qt. 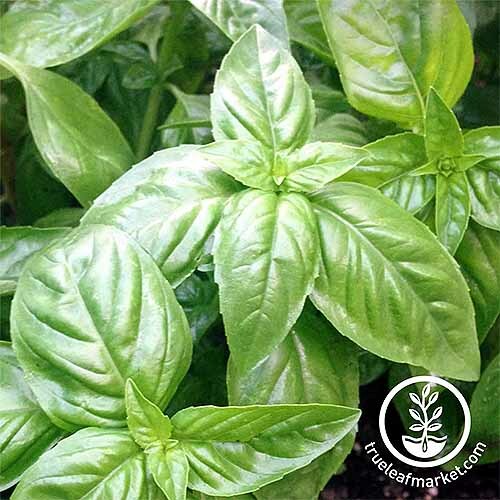 Basil is known to be a heavy feeder, or a plant that requires more nutrients than others. Use an organic fertilizer, such as Neptune’s Harvest Liquid Seaweed Plant Food, available on Amazon. Fertilize once every two weeks initially. When your plants reach maturity, cut back the feedings to once every four weeks. Tomatoes make a great companion to basil in the garden – a perfect pairing since they’re delicious together as well! The herb is said to improve the flavor of the vegetable – er, fruit – and vice versa. 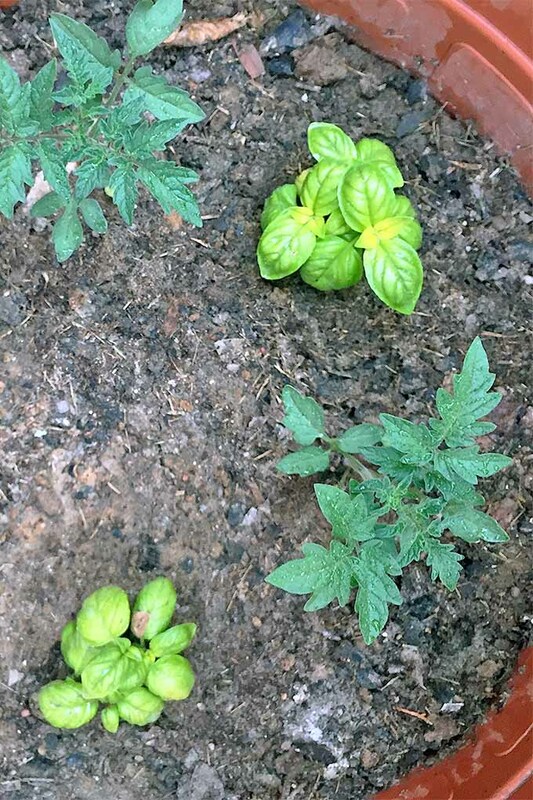 Basil also does well planted alongside other nightshades, so you could do well to plant it with bell peppers, hot peppers, potatoes, or eggplant. Planting chamomile near basil is also said improve the health of the plants. Avoid growing basil near culinary sage. Some gardeners say to avoid planting it near rue or anise as well. Though some say basil helps to repel aphids, in our experience, it often actually attracts them. Will planting basil help to keep aphids off of other plants, like your rose bushes? If this is your first line of defense, there are probably better methods out there. 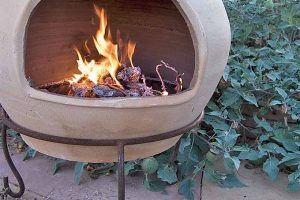 The plant’s aromatic oils do help to repel some pests more reliably, like flies and mosquitoes. Slugs and Japanese beetles will also happily munch on the leaves if they aren’t given a better option. Keep an eye out for any signs of damage and remove these bugs from your plants by hand. A good, hard spray with the hose may knock some unwanted visitors loose, but this may also bruise the leaves and otherwise damage your carefully cultivated herbs. 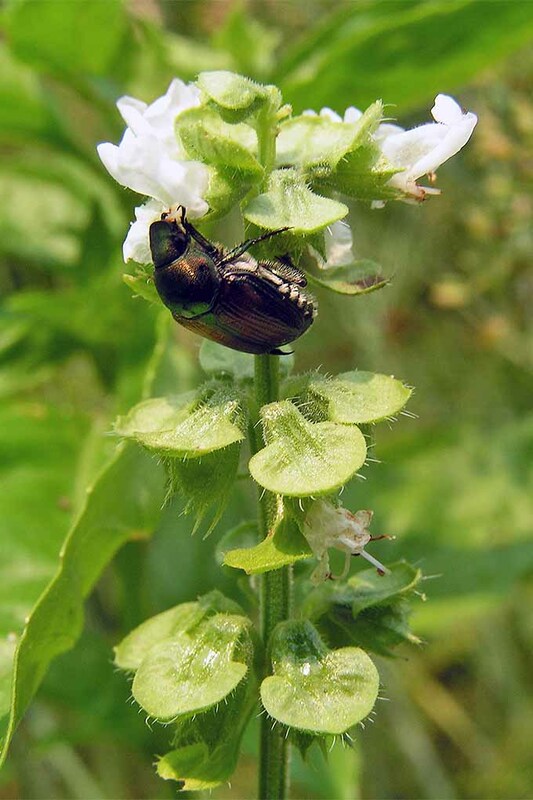 Japanese beetles may enjoy munching on your plants. 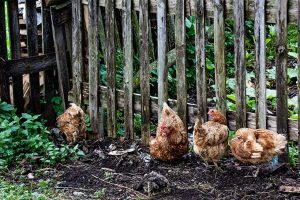 Check out our article on banishing snails and slugs from the garden for some more tried-and-true suggestions. Keep an eye out for fungal diseases as well, which can attack the leaves, stems, and roots of plants. This is a more common complaint than insect attack. To help prevent the onset of fungal disease, you want your basil to be well watered, but not waterlogged. Soil should be well draining, especially in containers, and you don’t want your herbs to sit in standing water. Water at the base of the plants, avoid getting the leaves wet, and be sure to grow plants in full sun. If fungus has already taken over, you can try disposing of the diseased leaves, but you will likely lose the plant. In this case, if it’s still early in the season, it’s best to start over and plant new seeds. Otherwise, better luck next year! Once your plants are mature and are producing large, vibrant, and aromatic leaves, it’s time to harvest! Pinch or cut the topmost leaves of the plants off and use as desired. 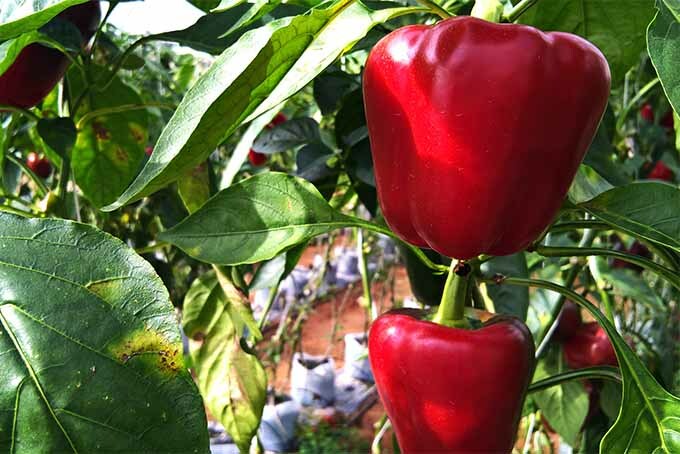 By clipping the tops, you encourage growth throughout the rest of the plant and reduce the risk of early flowering, encouraging plants to leaf out and become bushier and more productive as well. As long as the plant keeps producing, continue clipping or pinching in this manner and enjoy delicious, aromatic leaves all season long! And do use clippers, or wear gloves if you’ll be picking in any great quantity. 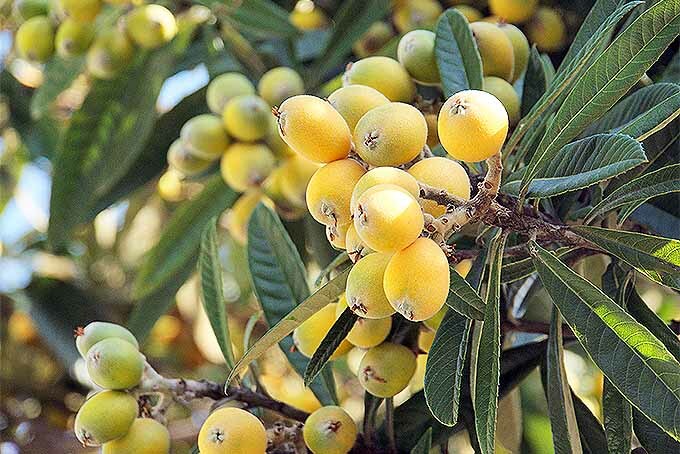 Though it isn’t harmful, the juices of this plant can stain your fingers. If flowers emerge at the top of the plant, be sure to clip them as well, to encourage continual growth. 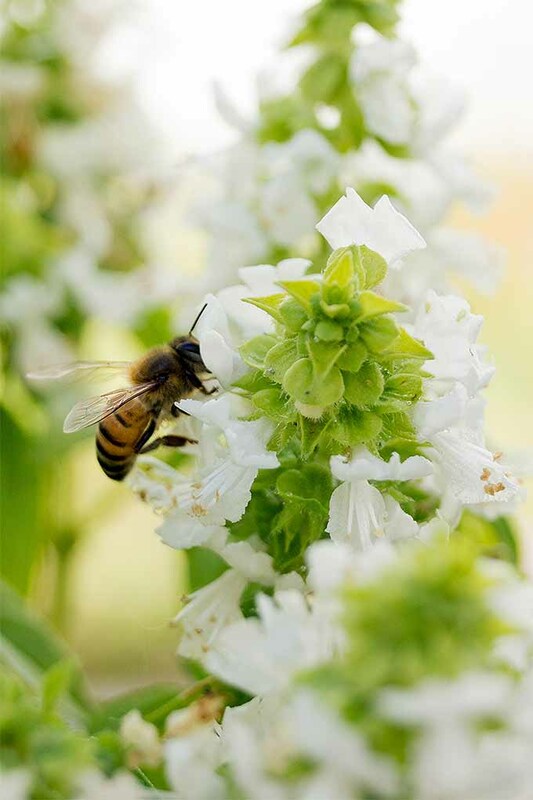 Pollinators do love flowering basil, so you may opt to let a few plants go to seed if you like. The flowers are also edible, and they can make a subtle garnish for salads and appetizer plates – these aren’t showstoppers like chive flowers, but they do get white or pink blooms, sometimes with touches of purple as well. Once a plant does flower and go to seed, the leaves will be of a lesser quality, since the plant’s energy is no longer being put into leaf production. Some varieties are self-seeding, so you may have some luck with starting a new crop for next year if you allow them to go to seed naturally. 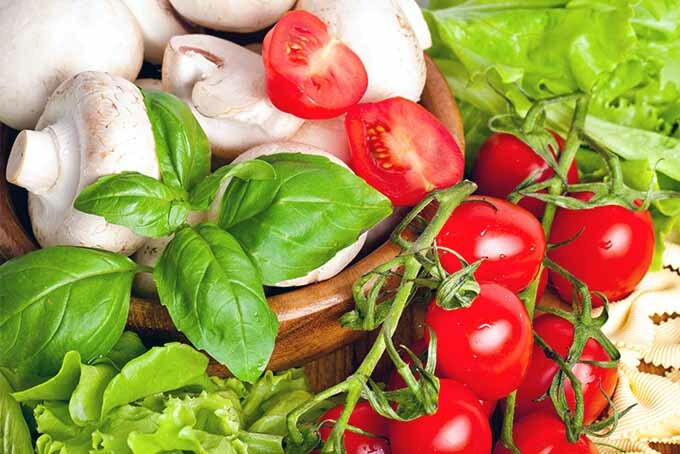 Basil is extremely aromatic and lends itself well to recipes with tomatoes and garlic, as well as lemon and olive oil. Another amazing culinary combination is basil with various hard or soft cheeses, such as mozzarella or chevre. Simply pinch off some leaves and place atop the cheese. Pair with a cracker or a piece of fresh bread, and you have a flavor explosion that’s ready to go! Basil can be used fresh or dried. It can even be frozen and kept in the freezer for up to six months to be used whenever the need arises. Just keep in mind that if frozen, basil will turn brown and will have a mushier texture when it’s defrosted. I prefer to freeze whole leaves in oil, or whizz up a few cups of herbs with some water and a shot of lemon juice in the blender before freezing in ice cube trays for individually portioned herb cubes. Despite the color change, freezing is the best way to retain the flavor of this herb if you need to store it. Premade pesto freezes well, and texture isn’t an issue if you plan to toss your herbs into a sauce, soup, or stew. For best results, wait to pick basil until you’re ready to use it. Place it in a glass of water on the counter for short-term storage rather than in the refrigerator. Love homemade pesto? Try this recipe from our sister site, Foodal. For a hearty meal, make a big pot of summer garden chicken stew from The Domestic Dietitian. Or, if you’re in the mood for lighter fare, these sesame and lime roasted shrimp summer rolls with mango and avocado from Feast in Thyme are not to be missed. Don’t forget to include this flavorful ingredient in refreshing summertime cocktails, like this strawberry basil margarita from Stress Baking! This fragrant herb also offers many potential health benefits. 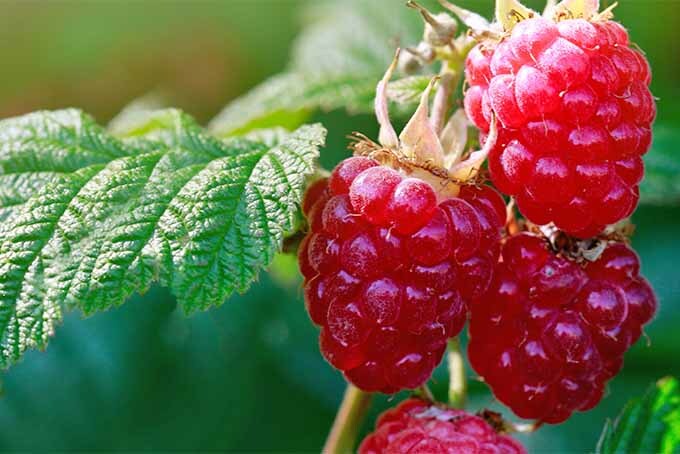 Packed with antioxidants, it also has antibacterial properties that may help to fight infection. 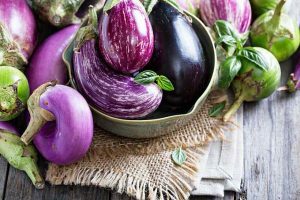 One study investigating the potential health benefits of basil has shown that purple varieties are typically higher in total phenolics, compounds responsible for the antioxidant activity of the herb, than green types. Medicinally, basil is probably best known as a potential curative for kidney problems. It’s also been used to treat snake bites and bug bites, acne and a lack of alertness, warts and worms. It’s been said to help reduce the duration of a cold or flu if you drink it as a strong tea, mixing it with lemon juice and honey. 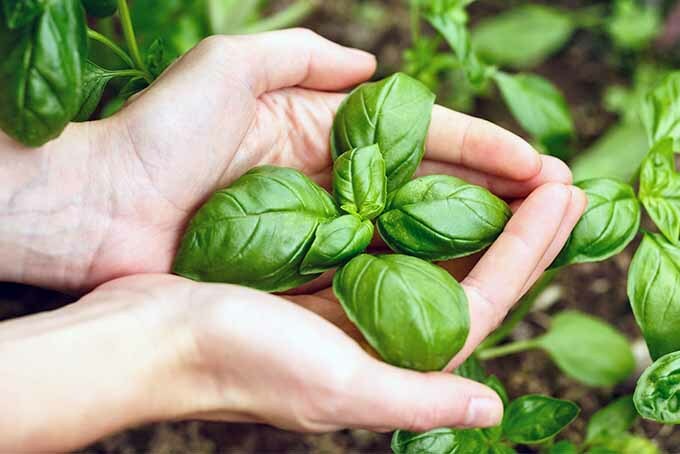 Because it also acts as an analgesic, when farmers and gardeners have a headache, some have been known to pull a few basil leaves off of the plant and rub them into their temples for relief. If you ever have indigestion, some herbalists suggest that you grab a few leaves and give them a chew, the lemon variety in particular if it is available. Breaking them down between your teeth releases the essential oils of the plant and stimulates the digestive system, helping to ease discomfort. Overall, it’s a good source of vitamin C, calcium, iron, magnesium, and potassium. But keep in mind: herbs are often eaten in much smaller quantities than other foods, so it’s usually difficult to meet your daily vitamin quotas with herbs. In short, basil is a wonderful addition to any garden, potted on a sunny windowsill in cooler weather or growing outdoors in a sunny spot. 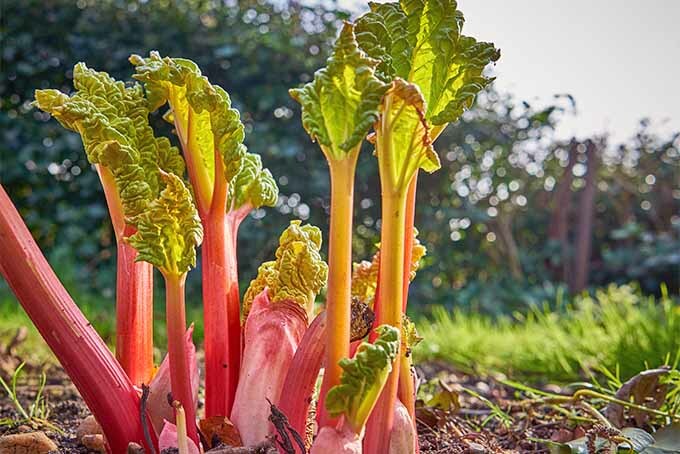 Plant it in pots on the patio or fire escape for easy harvesting, and add it to the veggie patch for a splash of vibrant colorful and fruitful yields. 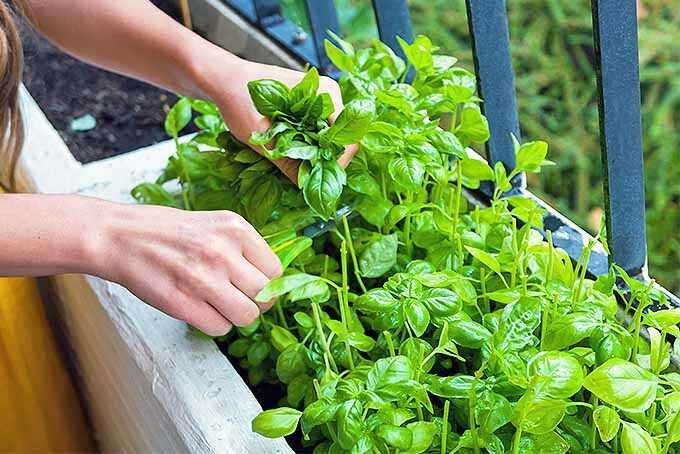 Even if you’re gardening in a small space, as long as you have a spot of sun, don’t skip the basil! Its aromatic quality is sure to please, and its robust flavor is a welcome addition to so many recipes. Be sure to share your stories of growing basil with us in the comments, and get in touch if you have any comments. Ready to add even more herbs to your garden? Check out all of our articles on the topic here. Product photos via South Slope Garden Supply, Nature Hills Nursery, True Leaf Market, and Neptune’s Harvest. Uncredited photos: Shutterstock. With additional writing and editing by Allison Sidhu.